Guests are always welcome; members are requested to attend. Umpire Sign-up is now open for the 2019 spring rec season. Click here! If you need to contact us, please see the Contact Us link at the top of our website. The 2019 SGSL season calendar has been posted. Calling all Softball Fans...SGSL Needs You! 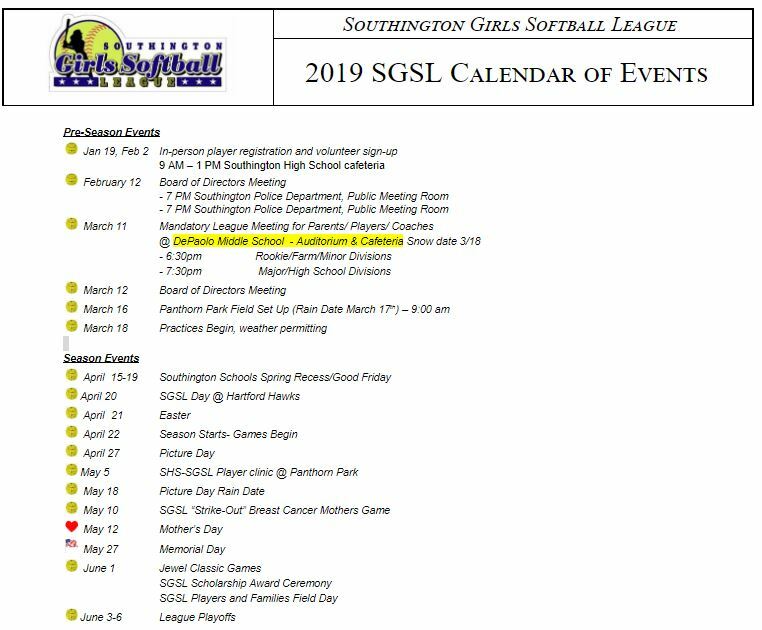 SGSL is excited to announce that on May 5th players of the Southington High School softball team - many of them former SGSL players themselves - will host a free clinic open to all SGSL players. The event will run from 10 AM to Noon at Panthorn Park. This fun and interactive clinic is open to SGSL players (including Lightning and Thunder) of all ages and will consist of defense, hitting, and base-running drills, arranged in groups by age. Learn from experienced players. Their record speaks for them - these girls are amazing and talented athletes! Don't miss this event! All of this activity is done for the benefit of all our girls by volunteers. SGSL is one of the finest, if not the finest, facility within the state of Connecticut, dedicated to girls' softball. Comments validating this have been made year after year by coaches and officials both within and outside of the Town of Southington. However, none of this happens without your help. It's true that everyone has a busy schedule these days, but just a few hours of your time can be an invaluable contribution to both the league and to our girls' total experience of the sport. So please, ask any of our Executive Board members how you can get involved and take pride in knowing that your contribution helped to make treasured memories on these fields for your young girl to last a lifetime. The Town of Southington has made available this document which contains important information that all parents should have access to for the safety of each girl playing softball. This form will also be available for parents to take during in-person registration sessions.